Our coaches to the games at York City and Darlington are definitely running. Places are still available on both coaches and the details are below. York City, Tuesday, 27th March. £18 for members, £13 for under 16 members and £23 for non-members. Coach leaves the Merseyrail Community Stadium at 3.45pm promptly. £20 for members £15 for under 16 members and £25 for non-members. Coach leaves the Merseyrail Community Stadium at 10.30am. To book, text Bill Sloan on 07952056385 or visit the Trust Office on Saturday. Earlier this month, representatives from the Trust board met with club chief executive Natalie Atkinson. The minutes from he meeting are available HERE. David Morgan has been voted the Trust in Yellow Player of the Month for February. 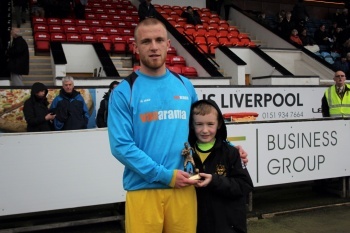 Morgan has been a key figure in Southport’s recent upturn in form, playing a central part in a month that saw the Sandgrounders collect maximum points from three games played. The Belfast-born 23-year-old, who signed from Harrogate Town in September, has impressed in setting the tempo for the team’s performances from the middle of the pitch, also claiming a goal in the win at North Ferriby United. Morgan was the winner of a closely-run supporters’ vote and was presented with his award by young supporter Cameron Hayes ahead of Saturday's win over Tamworth. It's time to vote for your Player of the Month for February, and what an excellent month it was! A 100% win record and some excellent performances and goals makes this vote potentially very difficult! You can vote by e-mailing fans@trustinyellow.com, on our facebook page or on our twitter feed. Get your votes in by Thursday 10pm. The award will be presented before Saturday's home game against Tamworth, and as always we are looking for another junior supporter to present the award. Please contact us if you would like to get involved.